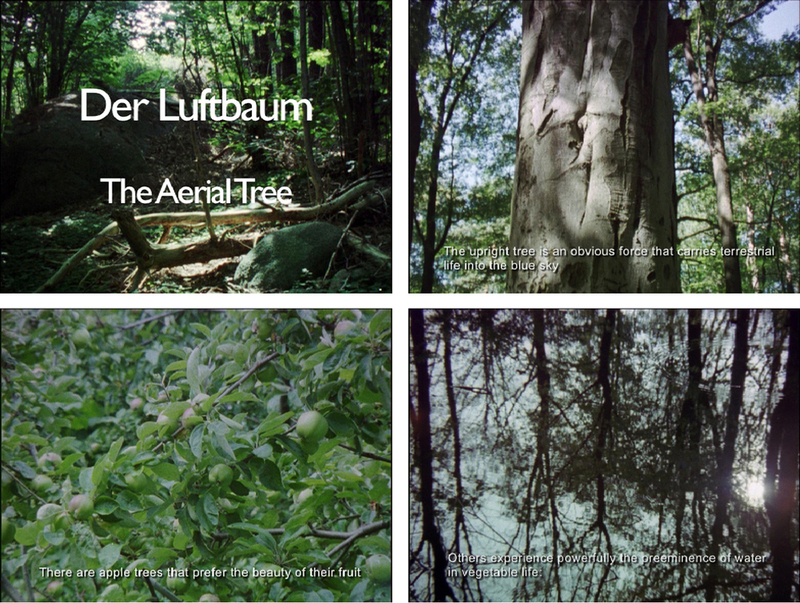 Trees, and their underlying symbolic power as an ever-growing vertical force, was the main theme of the film project entitled “Der Luftbaum”–“The Aerial Tree”. The film was based on the essay “L´ Air et les Songes” –“Air and Dreams”(1941) by French philosopher Gaston Bachelard (1884–1962), and specifically the chapter entitled “L´ Arbre Aerien” . Bachelard’s essay explores how contemplation of trees is linked to a multitude of common dreams and reveries. In his epistemological approach, he employs various quotes from authors including Rainer Maria Rilke, D. H. Lawrence and August Strindberg as a point of departure for an analysis of the inner striving and soul of the tree. The image of the tree as a link between heaven and earth, its roots deeply buried in the ground and branches high up in the air, become a central theme in Bachelard´s essay, as well as the endless dreams expressed by poets of the tree as a symbol of existential pain. The film piece consists of a voiceover of fragments of the essay, read by the actor Immo Kroneberg in German translation. The voiceover is accompanied by a variety of images of trees, forests, leaves and birds.